Biotic, is a new kind of Theme. In few words, it is the most powerful, easy to use, versatile E-Commerce WordPress theme. We built Biotic in order to let the user have the possibility to modify and control every part of their site easily. Everything in Biotic can be created from the front-end without having to know how to code. Our theme options panel also lets the user modify most of the parts of the site separately and will also let you modify your header, footer, menus, colors etc. All those amazing options are paired with an easy to use interface that allows anyone from beginner to advanced to build amazing, beautiful, responsive websites. 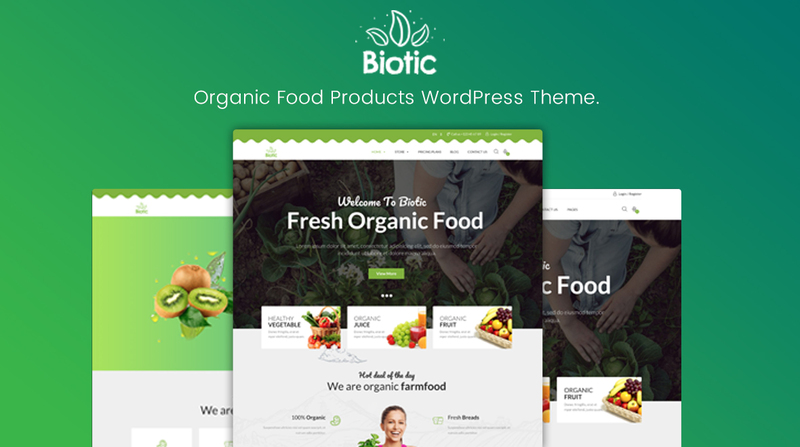 Biotic is more than a theme; it's a new tool to create any kind of E-Com websites without the need to know how to code. The main thing we would like you to understand is how powerful Biotic is but also how intuitive and easy it is to use. We made a full integration of the well known WPBakery page builder, we added our elements that will let you build stunning pages and didn’t changed anything to the initial plugin. So, you will still be able to use any custom add-ons you are used to. Biotic is definitely a game changer! It brings endless possibilities, top-notch support, and so many powerful, incredible features. Keep in mind that Biotic was made to be the most powerful, but also the most easy to use, theme on the market. A lot of thought and care went into this theme, making it a pleasure to use. - Strong focus on design and typography, usability and overall user-experience. - Compatible with many popular Plugins like WPML, Yoast, W3TC, Contact form 7, Slider Revolution, WooCommerce. - Theme Options (powered by Redux) are global settings that allow you to vastly change just about any portion of the site through easy to use options. They allow you to build custom sites without touching a line of code. These options are global and will apply to every page or post, unless overridden by page or post options. - You can change everything you see and this without coding anything. - Unlimited Colors options, you can customize your website to match your colors. - Easily change Font family and Font size. - Biotic Page Options work in tandem with the Theme Options. Page options are individual per page or post meaning they only affect the page or post you set them on. They will override theme options which allows you to have a unique page or post outside of your global settings. This vast network of options work together to allow you to build incredible websites. - Easily create stunning pages using our awesome elements. - WooCommerce shortcodes are included in the WPBakery. - Different title settings for pages, posts and archives etc. - Use color of custom image for background.